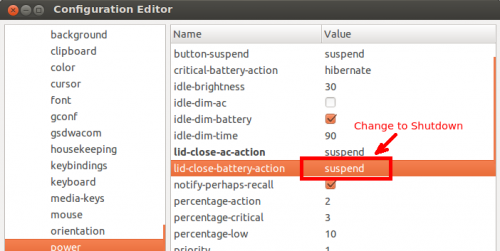 This simple tutorial is going to show you how to change the laptop lid close actions, including suspend, hibernate, do noting, and shutdown when the lid is closed in Ubuntu. 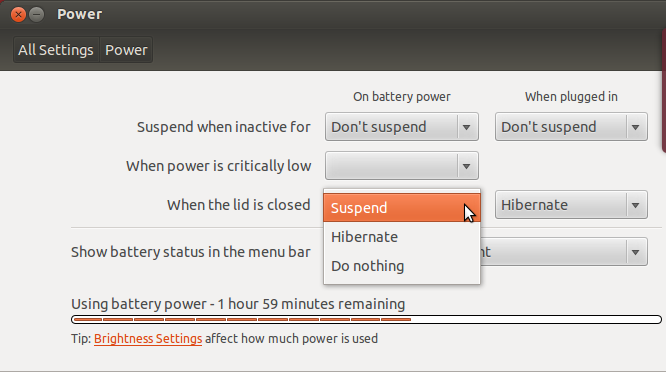 In Ubuntu 12.10 & 12.04, hibernate is disabled by default, so this handy tutorial will also show you how to enable hibernate. Then copy and paste following into the file and save. Need to restart to take effect. 2.) Now head to System Settings -> Power, there you can set laptop to suspend, hibernate, or do nothing when the lid is closed. Then launch Dconf-Editor from the dash, navigate to org -> gnome -> settings daemon -> plugins -> power. 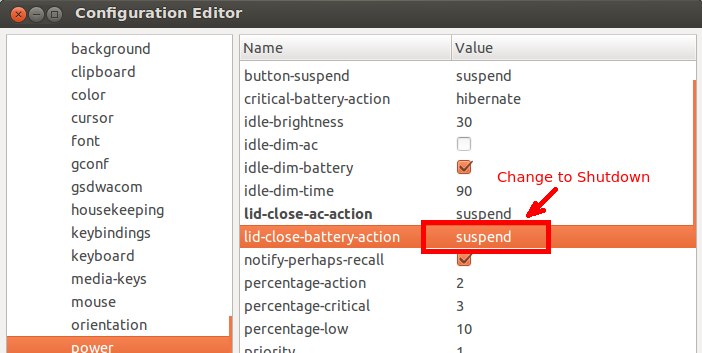 Change the value of “lid-close-battery-action” to Shutdown. Actually, when you change the settings in Power (see previous picture), it automatically changes the value in this picture. No user responded in " How to set the Laptop Lid close action in Ubuntu 12.04 "